We’ve got short instructions on installing your Package Bees or Nucleus Colony below – feel free to reach out with questions or clarification! Package bees are just boxes specially built to carry bees securely and safely. 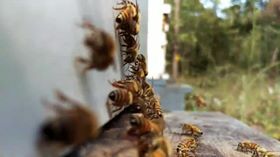 They are sold according to the weight of the bees with maybe 4000 to 5000 per pound. They mostly have the queen bee not unless the buyer has instructed otherwise. They are relatively cheaper compared to nucleus colony. To install the package bees, you will need to remove the center frames of the colony you’re moving the bees into. Remove the cage containing the queen bee first, then place the container on its side over the place you have removed the frames. Put the queen’s cage on top of a frame and gently turn the package inside out to assist the bees to fall into the hive. Prepare two frames where you shall place the queen cage and use pressure to hold it in place if you have existing comb – otherwise you can tie the cage with string or tape to secure her – you don’t want her to fall to the bottom of the hive. Once all the bees are out of the package, you can remove the package and set it in front of the hive (or on top).